LAS VEGAS, NV--(Marketwired - Jan 7, 2015) - TiVo (NASDAQ: TIVO) today announced the results of the second annual tablet and smartphone streaming analysis report from the Consumer Electronics Show (CES). The report reveals Sundays as the most popular day of the week to stream video to a mobile device, dramatic programming as the most watched genre and The Walking Dead as the primetime show most streamed to second screen devices. The findings also highlight detailed viewer behavior that shows an astounding 85 percent of programming streamed originating from viewer's DVR recordings. A comparison of streaming in July 2014 to November 2014, finds that the average number of streaming sessions per user has increased 22 percent, from 15.9 sessions in July to 19.4 sessions in November. The total monthly minutes per user has also increased 32 percent since July. TiVo expects usage and overall number of streaming sessions to continue to increase as viewers continue to desire access to their favorite content on multiple devices, anywhere. Further analysis reveals that streaming is more prevalent on weekends than on weekdays, with 20 percent more sessions on Saturday and Sunday -- mostly Sunday -- compared to Monday through Friday. Streaming activity peaked on the Sunday before Thanksgiving and continued at a high level throughout the subsequent week as it appears many utilized their vacation time to prepare for the holiday festivities and stream their favorite programs/sporting events. During the month of November alone, TiVo subscribers streamed 6.9 million minutes of video from their TiVo boxes to their mobile devices, with three-quarters of that occurring within the home and the other 25 percent streamed to devices out-of-home. Eighty-five percent of the 6.9 million minutes consisted of previously recorded content; only 6 percent was live TV programming, with the balance being side-loaded content (programming that has been transferred directly to a mobile device at home and then played offline). "The overwhelming propensity viewers have to stream their recordings to a mobile device or tablet is true affirmation of how TiVo Roamio got its name -- the only way to truly roam with an entire advanced TV experience," stated TiVo's Chief Research Officer Jonathan Steuer. "Streaming tends to be largely associated with OTT services and various web content, but research shows us the incredible percentage of viewers utilizing streaming almost solely to watch their recorded shows in or out of the home on a second screen. This viewer behavior is exactly what makes TiVo Roamio so popular -- the full ability to stream anything at any time wherever you are." TiVo Research's analysis is based on aggregated, anonymous, second-by-second audience measurement data from a sample of 39,000 anonymous households with the Emmy Award winning TiVo service. 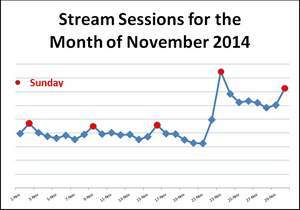 The report analyzed streaming for the months of July and November 2014. Streaming provides consumers the ability to stream and download their live TV and recorded content to the smartphones and tablets from anywhere. About TiVo Research and Analytics, Inc.
TiVo Research and Analytics, Inc., a wholly-owned subsidiary of TiVo Inc. (NASDAQ: TIVO), is a leading media marketing and analytics software company whose products help advertisers, agencies and television networks improve advertising targeting, accountability and return on media investment within the Automotive, Consumer Packaged Goods, and Pharmaceutical industries, as well as a growing number of client CRM engagements. TiVo Research's web-based Media TRAnalytics® and TV Health Ratings platforms matched the TV advertising households actually receive with the products the same households actually buy, enabling clients to find "The Right Audience®" while providing an unmatched level of transparency, measurement, media planning/selling and improved ROI. TiVo Research clients include Procter and Gamble, CBS, A&E Television Networks, ION Media, Oscar Mayer, Sunovian and Starcom MediaVest Group. More information at: www.tivoresearch.com. TiVo, the TiVo logo, WishList, Season Pass, Roamio, Media TRAnalytics and The Right Audience are trademarks or registered trademarks of TiVo Inc. or its subsidiaries. All other trademarks are the property of their respective owners.